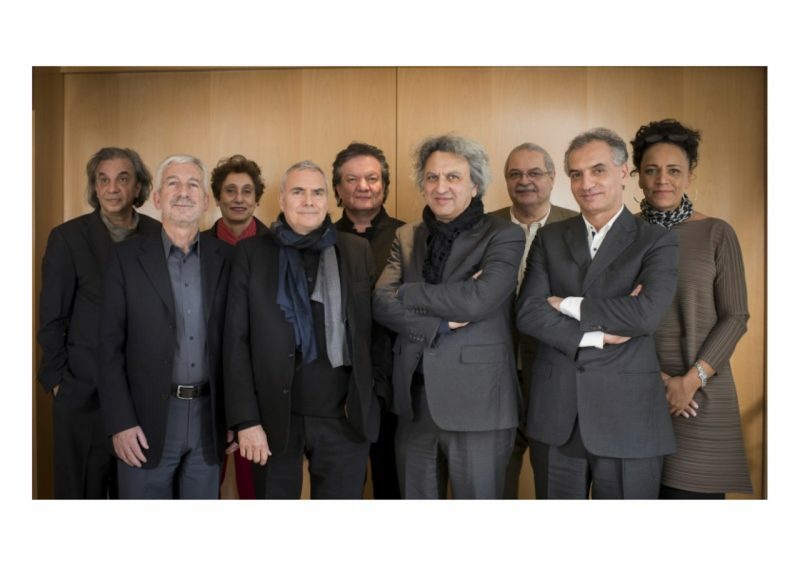 The 2016 Master Jury for the Aga Khan Award for Architecture; Professor Lesley Lokko is at the far right. Photo courtesy Lokko, used with permission. Who would have thought that architecture could be so closely connected to things like identity, culture and politics? Certainly not Professor Lesley Lokko , back when she was studying the discipline at London's prestigious Bartlett School of Architecture . But now, as head of the Graduate School of Architecture  at the University of Johannesburg  in South Africa — which she plans to make the “biggest and the best on the continent” — Lokko doesn't see things in the typical way. This unique perspective is just one of the reasons she's considered such a prominent figure in the emergent African architectural scene. Lokko enjoys examining these sorts of juxtapositions. Half Ghanaian, half Scottish, she first studied sociology, then Hebrew and Arabic at Oxford, then decided she wanted to become an architect. She graduated from the prestigious Bartlett School of Architecture  in London and began her professional career, while simultaneously creating a name for herself as a best-selling novelist . On the invitation of the Trinidad and Tobago Institute of Architects  and Bocas Lit Fest , the country's premier annual literary event, Lokko recently made her first visit to the twin island republic, where she gave a few public lectures on the importance of architecture in today's society, literature and more. 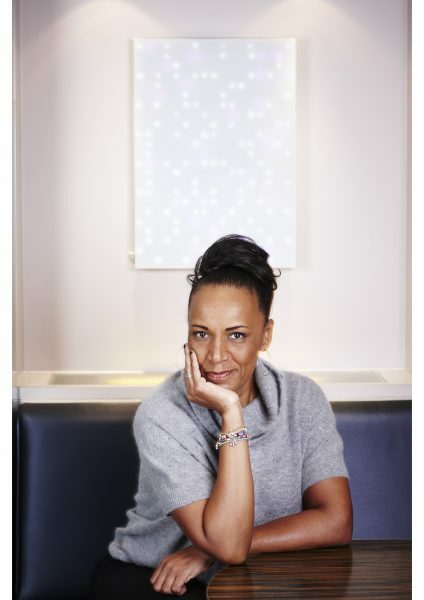 Architect and author Lesley Lokko. Photo used with permission. She sat down with Global Voices for a fascinating chat about globalisation and identity, and the parallels she sees between Caribbean and African societies. In this, the first of a series of posts about her visit, we discuss race, culture, innovation, and the impact that architecture can have on society, particularly postcolonial ones. Global Voices (GV): How did you come to be Professor Lesley Lokko? You seem quite liminal in a field that's generally all about structure. Lesley Lokko (LL): My father was part of the first wave of Africans who were sent overseas to study. A lot of them came back with foreign wives, so there was a whole generation of — we call ourselves ‘half-castes’ — that’s a particular Ghanaian term, but a whole bunch of mixed race kids who are the product of that particular period in history. GV: Did that help shape your worldview? LL: It did, and I’m probably more conscious of it now in a much more positive way, because I think the early years — not so much childhood because you’re sort of oblivious — but teenager, early adulthood, I think the struggle was very much to reconcile being from two places that were actually very different, but that it was okay. I grew up in Ghana, went to school in Ghana, then at the age of 17 I was sent overseas to boarding school in England. I’ve written about this since — I left Ghana knowing very clearly that I was half Scottish and half Ghanaian, and when I arrived in Britain the next morning, I was black. And it’s not that I didn’t know what black was, but suddenly the black part of it was the overarching identity. And it took me a long time to come to terms with that because blackness to me, particularly in Britain in those days, simply seemed to me not being white — and I couldn’t quite get my head around now not being something was the primary identity; that somehow you’re identified by a lack of something. GV: Let's talk about that in relation to architecture. Looking at apartheid-era South Africa, for instance, how does architecture enhance — or limit — people's potential? How does space affect output? LL: Historically, the role of the architect was always to project onto the ground the social and cultural values of any given society — in other words, to build representations of the values that a particular culture holds dear. To give a more concrete example, you could say a house is a representation to the outside world of the aspirations, hopes and experiences of the people living inside it. But at the same time, you don’t expect your built structures to represent the real you — what you’re looking for is the best possible representation — the ambitious, cultured image of yourself. You don’t expect your buildings to represent your tensions, your insecurities and your mistakes; you want your architecture to represent the best of you. If we think about the colonial and post-colonial world, at nominal independence, which is the political franchise, suddenly you take the emotional experience of that period of your own history — the struggles for self-determination, self-worth and the re-evaluation of what’s usually been a suppressed and oppressive history — but you find that it’s very difficult for your architecture to express that. What tends to happen is that the new political reality simply borrows the ‘old’ or existing architecture — the structures, buildings, ways of living and working — and you’re unable to articulate what the tension between that real, lived experience of the struggle for independence might have been and what your aspirations for the future now are. In South Africa, certainly, architecture was always complicit in oppression. Apartheid might have been a political and social structure, but it was also a physical one. Now, two generations after that first wave of great decolonisations in Africa and a generation after South African independence, I think people finally have the courage to look at this discipline that they’ve studied and to think about it differently. It's a complicated thing. Architecture is a seven-year course and during the time you’re studying, you also change. Architecture changed fundamentally the way I think — it didn’t just change the way I see things, it altered the very structure of how I see. So suddenly I’ve become complicit in it, because the things in my profession that are valued — whether those are aesthetic, or political, or social — have become my own vocabulary, and that vocabulary actually can’t accommodate this previous history, which has a lot to do with discomfort, with shame, with guilt, with envy…very complex emotions that the discipline is not easily able to translate. Apartheid couldn’t have happened without complicity of the architectural profession — that spatial carving up of the landscape — blacks live here, whites live here. This is how a white person should live and work; that’s what a black person ‘deserves.’ The standard township house was called an NE51 (non-European 51). It’s a child’s model of a house that’s essentially a box: window, window, front door, four identical ‘rooms’ that could be anything — bedroom, kitchen, living-room — there was absolutely no difference. That model replicated across an entire landscape, but some architect actually designed that. That model didn’t just ‘happen’. Many of the heroes of South African architecture, men who went out in the ‘20s, ‘30s and ‘40s to Europe and the United States to study or apprentice returned with a dilemma. In the West, architecture has always had an avant-garde, slightly left-leaning, and socially-engaged philosophy. But in South Africa, these same men who had studied under some of the great modernists, had to come back and implement the most repressive housing policies, land policies, spatial policies. And so for me, in South Africa, there’s a kind of dilemma at the heart of the discipline. I keep comparing it to a wound that somehow won’t close. To make matters worse, since independence in the '90s, very little ‘new’ blood — new thinking, new ways of articulating the discipline, new ways of teaching — has come into education, into the academy. There are now proportionally fewer educators and teachers of architecture at a time when the discipline is enjoying a resurgence of popularity, and I think some of that is to do with shame. Architecture’s one of the most interesting disciplines because it’s so lateral. People think of architecture as being vertical, but it’s actually the opposite. It touches on the surface of almost everything, so counter to the way you see it, it operates at multiple levels across a wide range of things, which makes it a very diffused discipline. So in a strange way, it’s a very good discipline for talking about these sorts of things — race, identity, gender, power — but I also think it’s up to diasporic, post-colonial architects to grab that opportunity with both hands. It’s difficult, because it’s almost like patricide — you have to kill off your own father (architecture) — in order to say something else. It’s a terrible irony that in the United States, more prisons are built than new homes. When you think of the proportion of African American men who are in jail, what does that say about a society’s idea of ‘home’? GV: What has struck you about Trinidad and Tobago's architecture? LL: On the one hand, it’s quite schizophrenic — you drive down the street and you’ve got simultaneously California, West Africa, India — it’s a mash-up, but it’s also a very exuberant one. When I came in, it was late at night but it was a holiday, so the streets were completely empty. So we drove in from the airport and suddenly you get to the centre of town and there’s huge, loud, noisy action and I think, ‘Oh! I could be in Accra!’ And then you roll out onto the Savannah  and there’s no-one on the streets. It’s very quiet, with all these stately colonial houses  — Naipaul  lived here and this person studied there — and you sweep across to this James Bond Hilton . 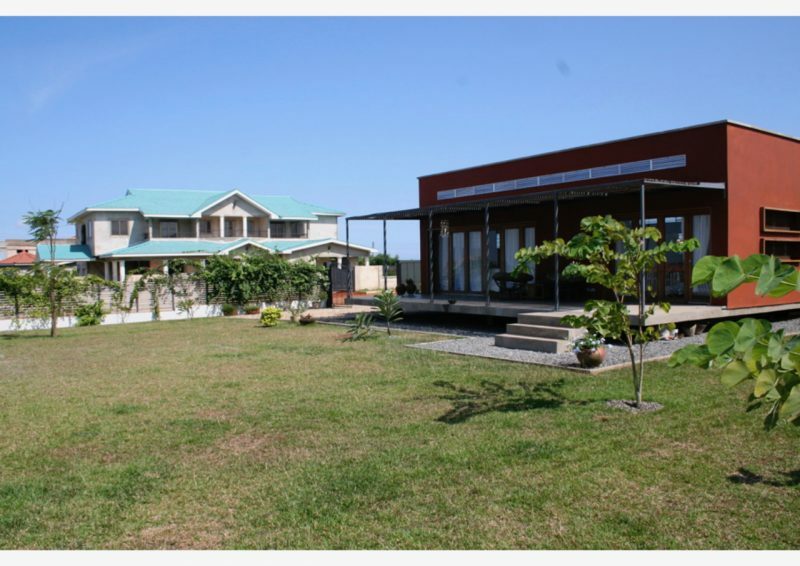 The house that Professor Lesley Lokko designed and built upon her return to Ghana. Photo courtesy Lokko, used with permission. When Lokko left the UK and moved back to Ghana to work as a writer, the first thing she did was build a house — out of mud — a modern house, built using a traditional technique. In Trinidad and Tobago, that traditional style of house was called “ajoupa” . Created by the Amerindians, the style was freely adapted over the centuries by the country's settlers to the point where architect John Newel Lewis  called it “the prototype of Trinidad architecture”. GV: This traditional building approach is no longer used in Trinidad and Tobago, primarily because it could not scale — and with globalisation, there is now greater consumption of foreign trends. Are we discounting our own innovativeness? 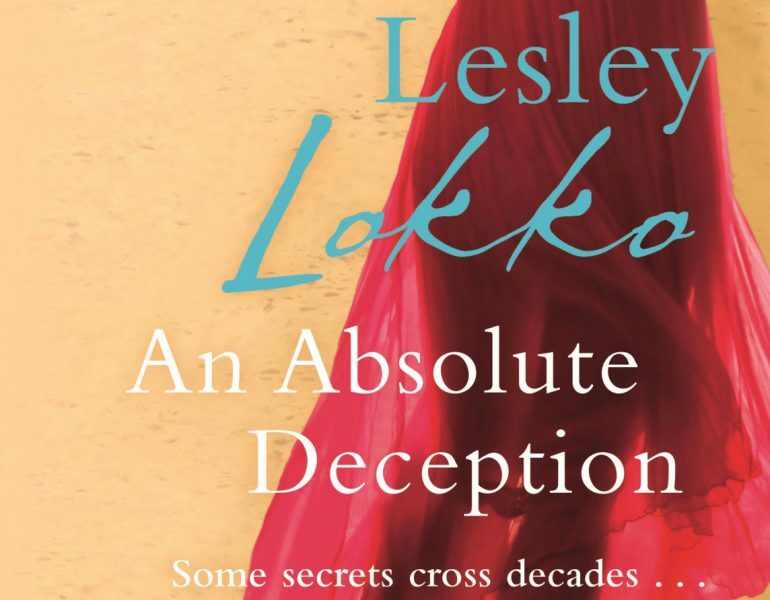 A detail of the cover of one of Lesley Lokko's novels. Image provided by Lokko and used with permission. LL: So to answer your question about taste, because those sorts of things are the underlying structure in terms of how taste is formed, what you see in West Africa, for instance, is that the manufacturing plant that once made a particular product is going out of business because another product is overtaken it. But on the side of the road you’ll find an enterprising young man who takes bamboo and tries to make that product, but doesn’t have the infrastructure of a small company, [so] he’s locked into a copy relationship forever. He’s not generating anything new; all he’s doing is trying to approximate, but that approximation is also the formation of its own taste. It’s a really deep-seated relationship between the confidence of the self to generate culture and the insecurity that simply follows culture, always from somewhere else — but even in that act of following culture it’s producing something. It’s almost like self-deception — you think you’re not putting yourself into it because you are copying it, but every act of making is its own thing in a sense. My house doesn’t look like a mud house, but I remember my father coming when I was first building and he was very confused by the fact that there was only one room — what you’d call open plan. So he says to me one time, ‘My darling, where are you going to sleep?’ I pointed to the open space behind the bookshelf, and I said, ‘It's a loft, but it’s also exactly the way people in Ghana traditionally lived — in single rooms that were joined in a compound structure.’ And my dad then started going around Accra saying, ‘You know, my daughter is reinventing the traditional Ghanian way of living!’ So it was no longer a loft or an open plan, it was now a traditional African whatever — and in the end, I think the fact that it was made out of mud became less important to people. And I do now see copies of that house — maybe not made of mud, but they are emerging — so again, something starts off as something quite innocuous and people start to copy it. I think that’s the point about providing a platform here in Trinidad for people to discuss the impact of those very small moves, because in much bigger metropoli, you have events like this…five a week kind of thing. In Ghana, to put on an event at the Institute of Architects where people come and discuss architecture is quite unusual, and so people are kind of relegated to just copying stuff off the street because there’s no platform to discuss things in any other way. In the next instalment of this series, the conversation turns to technology, relationships and the synergies between architecture and writing.